This is a shield-shaped Yosemite Lager porcelain sign. This particular Yosemite Lager sign is predominantly yellow and blue with red and white text. 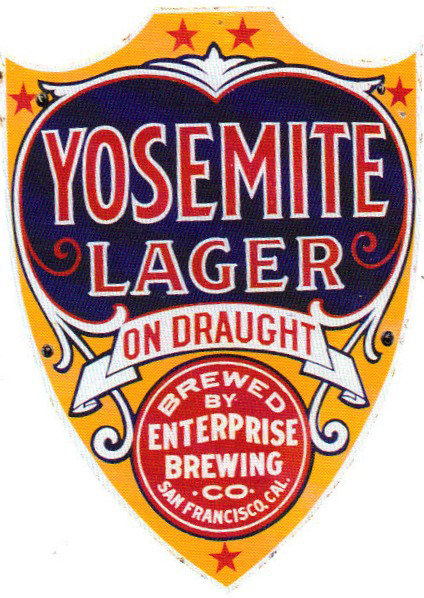 It reads, “Yosemite Lager On Draught, Brewed By Enterprise Brewing Co., San Francisco, Cal.” and features a white banner over a red circle at the bottom of the sign in addition to five red stars. This is a very rare and highly desirable sign. Very few were made and probably less than four are documented in collections.